Today’s economic conditions reflect a fiat monetary system held together by many tricks and luck over the past 40 years. The world has been awash in paper money since removal of the last vestige of the gold standard by Richard Nixon when he buried the Bretton Woods agreement — the gold exchange standard — on August 15, 1971. Since then we’ve been on a worldwide paper dollar standard. Quite possibly we are seeing the beginning of the end of that system. If so, tough times are ahead for the United States and the world economy. A paper monetary standard means there are no restraints on the printing press or on federal deficits. Since 1971, our dollar has lost almost 80% of its purchasing power. Common sense tells us that this process is not sustainable and something has to give. So far, no one in Washington seems interested. Although dollar creation is ultimately the key to its value, many other factors play a part in its perceived value, such as: the strength of our economy, our political stability, our military power, the benefit of the dollar being the key reserve currency of the world, and the relative weakness of other nation’s economies and their currencies. For these reasons, the dollar has enjoyed a special place in the world economy. Increases in productivity have also helped to bestow undeserved trust in our economy with consumer prices, to some degree, being held in check and fooling the people, at the urging of the Fed, that “inflation” is not a problem. 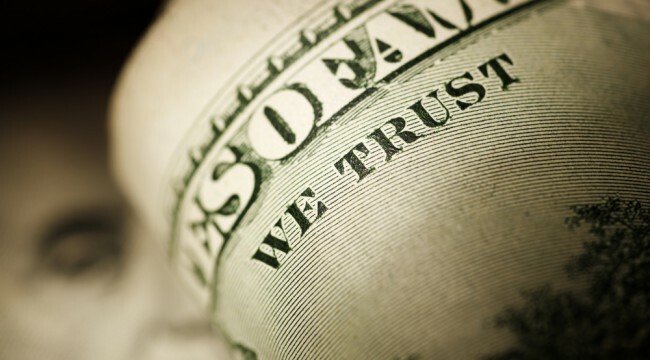 Trust is an important factor in how the dollar is perceived. Sound money encourages trust, but trust can come from these other sources as well. But when this trust is lost, which always occurs with paper money, the delayed adjustments can hit with a vengeance. The stagflation of the 1970s baffled many conventional economists, but not the Austrian economists. We own the printing press and create as many dollars as we please. These dollars are used to buy federal debt. This allows our debt to be monetized and the spendthrift Congress, of course, finds this a delightful convenience and never complains. As the dollars circulate through our fractional reserve banking system, they expand many times over. With our excess dollars at home, our trading partners are only too happy to accept these dollars in order to sell us their products. Because our dollar is relatively strong compared to other currencies, we can buy foreign products at a discounted price. In other words, we get to create the world’s reserve currency at no cost, spend it overseas, and receive manufactured goods in return. Our excess dollars go abroad and other countries — especially Japan and China — are only too happy to loan them right back to us by buying our government and GSE debt. Up until now both sides have been happy with this arrangement. But all good things must come to an end and this arrangement is ending. The process put us into a position of being a huge debtor nation, We now owe foreigners more than any other nation ever owed in all of history, over $17.5 trillion. Once this process starts, interest rates will rise. And in recent weeks, despite the frenetic effort of the Fed to keep interest rates low, they are actually rising instead. The official explanation is that this is due to an economic rebound with an increase in demand for loans. Yet a decrease in demand for our debt and reluctance to hold our dollars is a more likely cause. Only time will tell whether the economy rebounds to any significant degree, but one must be aware that rising interest rates and serious price inflation can also reflect a weak dollar and a weak economy. The stagflation of the 1970s baffled many conventional economists, but not the Austrian economists. Many other countries have in the past suffered from the extremes of inflation in an inflationary depression, and we are not immune from that happening here. Our monetary and fiscal policies are actually conducive to such a scenario. In the short run, the current system gives us a free ride, our paper buys cheap goods from overseas, and foreigners risk all by financing our extravagance. But in the long run, we will surely pay for living beyond our means. Debt will be paid for one way or another. An inflated currency always comes back to haunt those who enjoyed the “benefits” of inflation. Although this process is extremely dangerous, many economists and politicians do not see it as a currency problem and are only too willing to find a villain to attack. Surprisingly the villain is often the foreigner who foolishly takes our paper for useful goods and accommodates us by loaning the proceeds back to us. It’s true that the system encourages exportation of jobs as we buy more and more foreign goods. But nobody understands the Fed role in this, so the cries go out to punish the competition with tariffs. Protectionism is a predictable consequence of paper-money inflation, just as is the impoverishment of an entire middle class. It should surprise no one that even in the boom phase of the 1990s, there were still many people who became poorer. Yet all we hear are calls for more government mischief to correct the problems with tariffs, increased welfare for the poor, increased unemployment benefits, deficit spending, and special interest tax reduction, none of which can solve the problems ingrained in a system that operates with paper money and a central bank. If inflation were equitable and treated all classes the same, it would be less socially divisive. But while some see their incomes going up above the rate of inflation (movie stars, CEOs, stock brokers, speculators, professional athletes), others see their incomes stagnate like lower-middle-income workers, retired people, and farmers. Likewise, the rise in the cost of living hurts the poor and middle class more than the wealthy. Because inflation treats certain groups unfairly, anger and envy are directed toward those who have benefited. The long-term philosophic problem with this is that the central bank and the fiat monetary system are not blamed; instead free market capitalism is. This is what happened in the 1930s. The Keynesians, who grew to dominate economic thinking at the time, erroneously blamed the gold standard, balanced budgets, and capitalism instead of tax increases, tariffs, and Fed policy. This country cannot afford another attack on economic liberty similar to what followed the 1929 crash that ushered in the economic interventionism and inflationism which we have been saddled with ever since. These policies have brought us to the brink of another colossal economic downturn and we need to be prepared. Big business and banking deserve our harsh criticism, but not because they are big or because they make a lot of money. Our criticism should come because of the special benefits they receive from a monetary system designed to assist the business class at the expense of the working class. Labor leader Samuel Gompers understood this and feared paper money and a central bank while arguing the case for gold. Since the monetary system is used to finance deficits that come from war expenditures, the military industrial complex is a strong supporter of the current monetary system. Liberals foolishly believe that they can control the process and curtail the benefits going to corporations and banks by increasing the spending for welfare for the poor. But this never happens. Powerful financial special interests control the government spending process and throw only crumbs to the poor. The fallacy with this approach is that the advocates fail to see the harm done to the poor, with cost of living increases and job losses that are a natural consequence of monetary debasement. Therefore, even more liberal control over the spending process can never compensate for the great harm done to the economy and the poor by the Federal Reserve’s effort to manage an unmanageable fiat monetary system. Economic intervention, financed by inflation, is high-stakes government. It provides the incentive for the big money to “invest” in gaining government control. The big money comes from those who have it — corporations and banking interests. That’s why literally billions of dollars are spent on elections and lobbying. The only way to restore equity is to change the primary function of government from economic planning and militarism to protecting liberty. Without money, the poor and middle class are disenfranchised since access for the most part requires money. Obviously, this is not a partisan issue since both major parties are controlled by wealthy special interests. Only the rhetoric is different. Our current economic problems are directly related to the monetary excesses of three decades and the more recent efforts by the Federal Reserve to thwart the correction that the market is forcing upon us. Paper money encourages speculation, excessive debt, and misdirected investments. The market, however, always moves in the direction of eliminating bad investments, liquidating debt, and reducing speculative excesses. What we have seen, especially since the stock market peak of early 2000, is a knock-down, drag-out battle between the Fed’s effort to avoid a recession, limit the recession, and stimulate growth with its only tool, money creation, while the market demands the elimination of bad investments and excess debt. The Fed was also motivated to save the stock market from collapsing, which in some ways they have been able to do. The market, in contrast, will insist on liquidation of unsustainable debt, removal of investment mistakes made over several decades, and a dramatic revaluation of the stock market. In this go-around, the Fed has pulled out all the stops and is more determined than ever, yet the market is saying that new and healthy growth cannot occur until a major cleansing of the system occurs. Does anyone think that tariffs and interest rates of 1% will encourage the rebuilding of our steel and textile industries anytime soon? Obviously, something more is needed. Monetary policy today is designed to demonetize gold and guarantee for the first time that paper can serve as an adequate substitute in the hands of wise central bankers. Trust, then, has to be transferred from gold to the politicians and bureaucrats who are in charge of our monetary system. This fails to recognize the obvious reason that market participants throughout history have always preferred to deal with real assets, real money, rather than government paper. This contest between paper and honest money is of much greater significance than many realize. We should know the outcome of this struggle within the next decade. Ed. Note: Readers of The Daily Reckoning email edition were treated to this essay from Dr. Ron Paul before almost anyone else, in the special Sunday Edition – a “bonus issue” designed specifically to give readers a leg-up on the markets before the start of a new trading week. From broad market principles to specific chances to discover real, actionable investment advice, the Daily Reckoning is currently giving over 300,000 lucky subscribers the info they need to safeguard and grow their wealth no matter what the market does. Don’t wait another minute. Sign up for The Daily Reckoning, for FREE, right here.